fototazo: The Image: Steve Davis, "Summer on the Skokomish"
The Image: Steve Davis, "Summer on the Skokomish"
I've been photographing landscapes for a few years now. I thought it would be a nice break from portraiture, and I thought it would make for an easy project. But making good landscapes proved to be one of my hardest and most frustrating projects I've ever embarked on. I began working with 8x10 film, but found that driving through country sides on three- or four-day trips, equipped with a mere twenty exposures, just didn't work for me. (The costs of the film, processing, and the film holders pretty much dictated the number of film sheets available to me). I eventually switched to digital, and this at least allowed for a broader assault on my subjects. Among other things, I made a point to search for fires. I like what it tends to do to the atmosphere and how it influences the general quality of light. And of course, it always implies danger and assures a certain level of drama. But as to be expected, specifically searching for something tends to render it illusive. For two years I couldn't find a good fire (and wasn't willing to make my own). I eventually tied a bow around the project and called it done. In the summer of 2010 I bought used a Mamiya with a Leaf back on eBay. I took it out for a "test drive, just to play and find out if I really got a bargain or not. Driving down the Olympic Peninsula in Washington State I saw some smoke, turned off the highway and drove down a road that I hoped might get me close. I came across this scene, and couldn't believe my eyes. 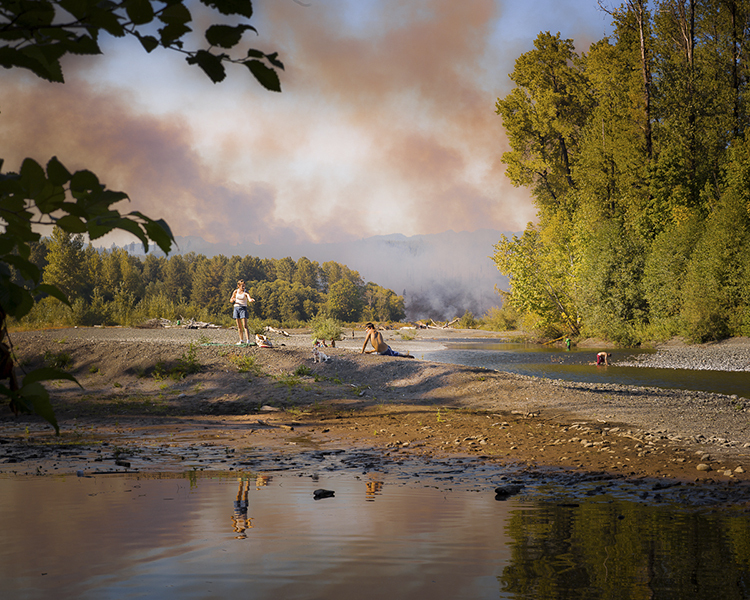 People were luxuriating on the banks of the Skokomish River next to a raging fire. They didn't seem to care. It was one of just a handful of hot days that summer, and a little fire wasn't going to get in their way. I've been asked if Summer on the Skokomish is a Photoshopped composite. It isn’t. I was just God damned lucky.